Extraordinary Journeys, together with an expert group of destination partners in Southern Africa, inspires travelers with a nine-night safari itinerary to Botswana and Zambia exclusively for its travelers. Zambia’s Kafue National Park is the new frontier of remote and exceptional game viewing. 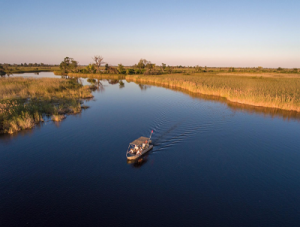 Now available for booking, this unique itinerary (which can be customized to traveler’s wishes) gives adventure-seeking travelers the opportunity to combine the untraveled sprawling terrain of Busanga Plains in Kafue with the game-rich Okavango Delta. To top the itinerary off, Extraordinary Journeys is offering a complimentary sunrise hot air balloon outing above Kafue National Park complete with a champagne toast and curated bush picnic. This nine-night adventure begins on the northern reaches of Botswana’s Okavango Delta with three nights at Little Vumbura, a beautiful six-room tented island camp only accessible by boat. The camp, which sits on a private concession nestled beneath forest canopies, offers spectacular and diverse opportunities for wildlife sightings along with an array of seasonal and year-round activities for guests to enjoy. From twice daily game drives into the grassy keeps of lion, leopard, elephant and buffalo among others, or navigating the channels of the famous ecosystem by mokoro (dugout canoe) or motorboat, to simply gazing at the magnificent Botswana sky from Little Vumbura’s star deck, guests are sure to satisfy their wild heart. 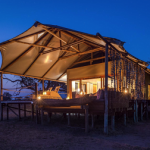 Upon arrival in Zambia, visitors will check into Toka Leya riverfront camp overlooking the mighty Zambezi River. Here, highlights include exploring one of the seven natural wonders of the world, Victoria Falls, river rafting the mighty Zambezi or visiting local villages accompanied by an expert guide along the way. For thrill seekers looking for a unique and eye-opening conservation experience, guests can choose to spend part of their visit tracking rhinos on foot, depending on scout availability. At camp, one can enjoy a tranquil afternoon at the spa or practice inspired yoga on the panoramic deck of the gym. The final three nights of this extraordinary journey will explore Zambia’s exclusive and virtually untouched Kafue National Park from the luxurious Shumba Camp. Woodlands, rolling plains, and major river-ways compose the expansive park where the camp sits, giving travelers an in-depth look into the country’s remote, wild and diverse character. From camp, guests can easily explore Busanga Plains, considered one of Zambia’s most important wetlands as well as a wildlife paradise with a wealth of plains game, predators and birds. Discover the area’s impressive array of wildlife through game drives, walking safaris or seasonal boat rides where visitors to this remote region are sure to encounter tree-climbing lion prides, red lechwe, hartebeest, buffalo, cheetah and more. Adventure to new heights with Extraordinary Journey’s exclusive complimentary* hot air balloon outing available to their guests only. The incredible opportunity to drift over the expansive plains of Kafue National Park’s six million acres as the sun rises, the single-balloon experience culminates with a champagne breakfast in the bush. Rates for this itinerary start at $11,000 per person sharing. *Terms and conditions apply. For more information about Extraordinary Journeys, visit www.extraordinaryjourneys.com.